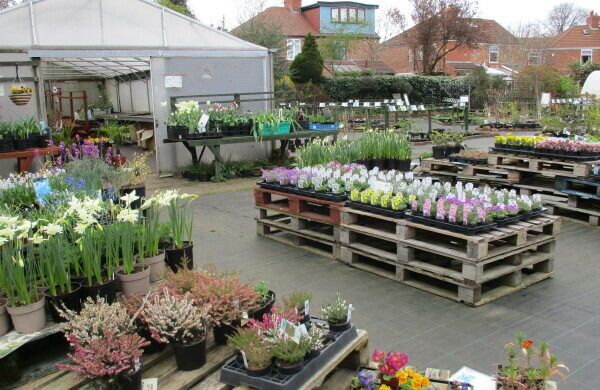 We have got a selection of potted bulbs and evergreen alpines – some are flowering now and more to flower a little later. A splash of colour to brighten up your garden and containers. The ground is warming up nicely – ready for a bit of planting. They will romp away now. Raspberry canes, which look like twigs at the moment, will bear fruit in July to October and rhubarb crowns are ready for planting out now. Fruit bushes including blueberries are starting to bud. Fruit trees – varieties of apples, pears, plums, cherries, damsons. Most are self- fertile and on semi dwarf rootstock. Evergreen, spring and summer flowering alpines are covered in flower buds. Spring and summer flowering Clematis also covered in flower buds……and so much more.